I was thinking the other day about how gardeners are a little bit like bouncers at a nightclub when it comes to wildlife. For some animals, like hummingbirds and thrushes, I’m unhooking the velvet rope and unrolling the red carpet. We invite these “VIPs” with open arms every year, and it must be pretty sweet for them – free food, comfy perches, and the fountain drinks are unlimited. Some animals, though,…well, let’s just say they need to get in line, and the line ain’t movin’. Rodents, skunks, and raccoons probably have great personalities when you get to know them, but they really don’t add a lot to the atmosphere. In fact, they kind of ruin the party. They trash the place, steal the decorations, hog the bird food buffet, and scare away my VIPs. What club owner wouldn’t be ticked off? Now, unlike bouncers, we’re not getting paid to chase these nuisances away. We’ve got to be smart about how we keep our garden “clubs” exclusive, without having to re-enact any scenes from Tom & Jerry. Here are a few of my best tips for keeping your unwanted guests out. Do you smell a rat? Well, it might be something else. 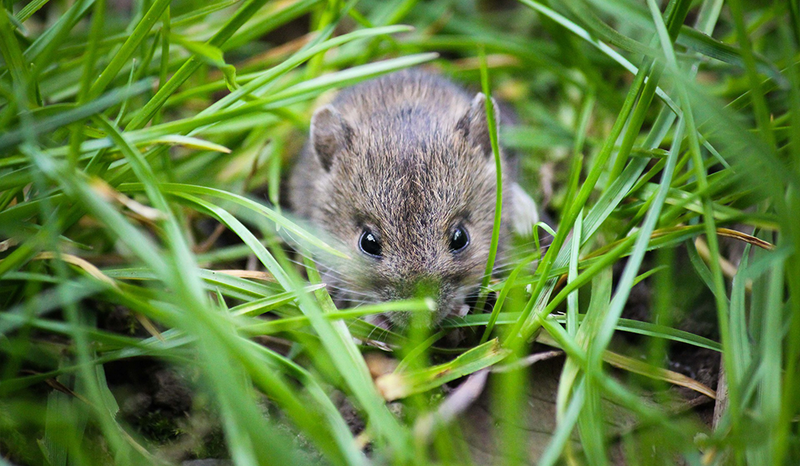 There’s an unsettling number of different rodent species in the Guelph/Cambridge area that absolutely love to cramp your garden’s style, and the first step toward eliminating them is to identify them. While most of us would rather see a mouse in our garden than in our pantry, the ideal situation is not to see them at all! Mice are pretty easy to recognize; rounded ears, pointy noses, long scaly tails, and grey-brown fur. They’re low to the ground, which means your tender shoots, bulbs, and root veggies are the most at-risk. Of course, once mice tuck into your garden bounty, it doesn’t take long for them to try tucking themselves under your door. The best thing you can do is make your garden too inhospitable for them to stick around. That means staying diligent about clearing plant debris, sealing any cracks in your home’s exterior walls, using garbage cans with properly-fitted lids, and keeping pet food and birdseed sealed or far from your home’s outer walls. Keep bulbs protected by surrounding them with crushed gravel. These clever, little twits are some of the toughest rodents to outsmart around here. Their compact little bodies are agile and naturally skilled at climbing virtually any surface and their large, bushy tails help them stay balanced on narrow branches and fences. Squirrels on their own wouldn’t be so bad if they weren’t so dreadfully obnoxious to birds. There are some things you can do to keep them away, like using free-standing feeders made of smooth metal (which is harder for them to climb) and keeping them away from trees and fences. We carry a few repellent products, Plantskydd and Critter Ridder, that tend to be really effective at shooing them away. Our Ontario squirrels also have a habit of going after veggie and herb gardens in the absence of bird food, too. If they’ve become a problem, you may find it less of a battle to simply plant them in containers and keep them on your deck. Most squirrels would rather not risk coming too close to your house. Cute? Yes. Pesky? More so. As sweet as their long, pointy ears and round, little bodies are, rabbits will devour virtually anything in your garden. Now that the snow is melting, you’re probably seeing the worst of their handiwork now on your fruit trees, burning bush, and fruit-producing shrubs. 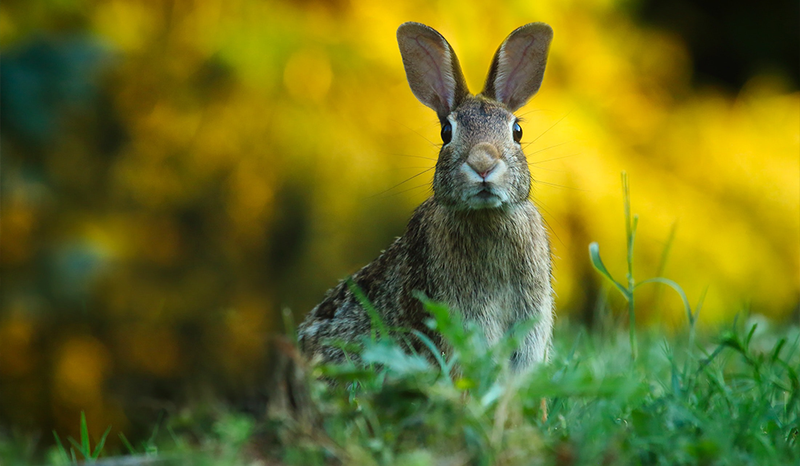 A family of rabbits can kill a tree or shrub by eating ½ to ¾ of the circumference of the trunk, but you may not even notice until June when the plant’s nutrient stores are depleted and the trunks are too severed to restock them. The best rabbit controls are great fencing and careful plant choices. Keep fences in good repair, make sure they’re installed at least 6 inches deep, and regularly inspect the perimeter of your property to look for areas where they might be squeezing in. Rabbit-proof plants are also becoming very popular, and our team is very knowledgeable on some great varieties to help you fight back. Keep that lawn groomed, too – it’s very common for rabbits to hide their babies under swaths of dried cut grass. Sorry, Pepe Le Pew, but we’ve got no love for you. You might smell skunks before you see them, but if you see their fuzzy, black bodies and telltale white stripes, don’t stick around! Skunks are already out looking for white grubs, but the beneficial nematode treatment that controls their food supply can’t be applied until the second or third week of May. How do you get rid of skunks in the meantime? Skunks nest under wood piles and under decks, so keep those areas organized, clear, and ideally also well-sealed or screened-in. Skunks are omnivorous and also chow down on fruits, berries, and nuts left in the garden. Rake up fallen fruit as soon as you can to prevent them from camping out. To get rid of skunks, try installing garden lighting. Since skunks are nocturnal, installing solar lights in your garden is a great and efficient way to keep skunks away while enhancing the evening ambiance. Repellents can also be quite effective at keeping them away. 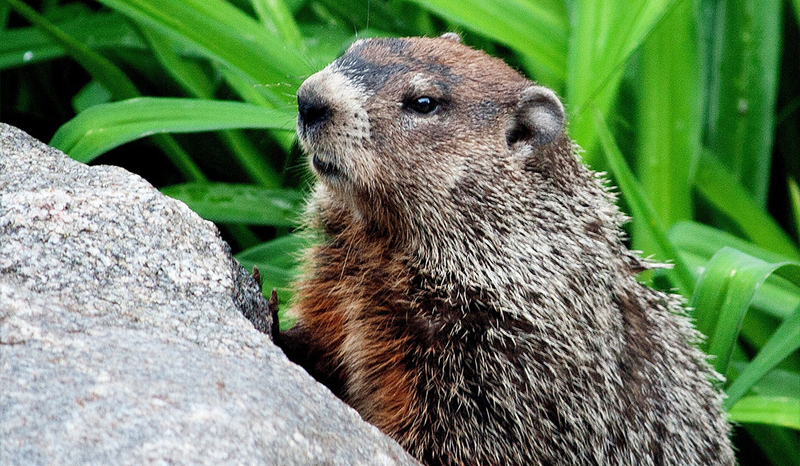 Moles and groundhogs themselves aren’t especially harmful to your garden, but the holes and tunnels they leave behind can be. Not only can their tunnels become home bases for more harmful pests, but they can also become a tripping hazard. Keep them out of the way by using a pheromone repellent – both moles and groundhogs are very shy and would rather not risk an encounter with a predator. Raccoons are just plain devious. With their talents for breaking into small spaces and stealing food, they come by their black “burglar” masks honestly. Raccoons are the nemesis of the vegetable gardener, especially those that grow corn! 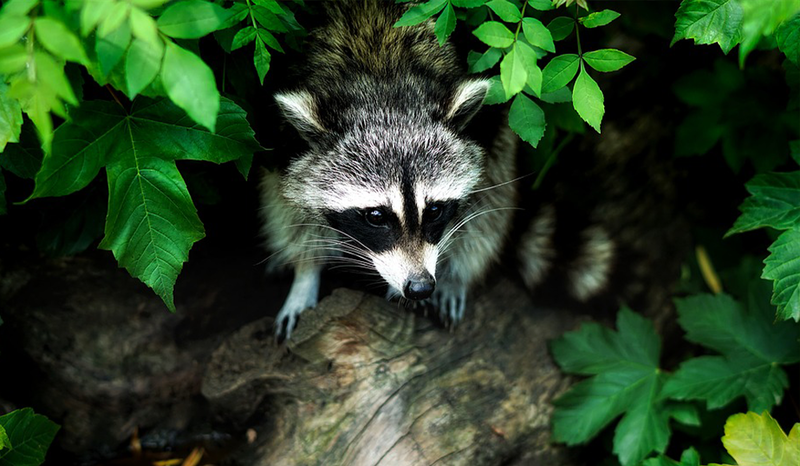 Proper fencing and clever “booby-trapping” is your best defense against raccoons. Try spreading a friend’s dog’s hair around the perimeter of your veggie garden (trust me, they’ve got lots to spare at this time of year! ), or just make your kids’ dreams come true and get your own. Strategically planting squash plants or roses around your precious veggies can also help – raccoons hate the thorns! Oh, deer me – those deer are a pest to deal with. Deer have the obvious advantage of being frigging enormous – they can damage trees up to 6-8 feet off the ground! If deer are an issue in your area, consider investing in better fencing. Fences at least 8-12 feet will be the bare minimum to keep these skilled jumpers away, and a slight outward flare on the fencing helps to make it even harder for deer to make it over. Boxwoods and other dense evergreens around the circumference of the fence can do double-duty as extra deer protection and ornamental accents. 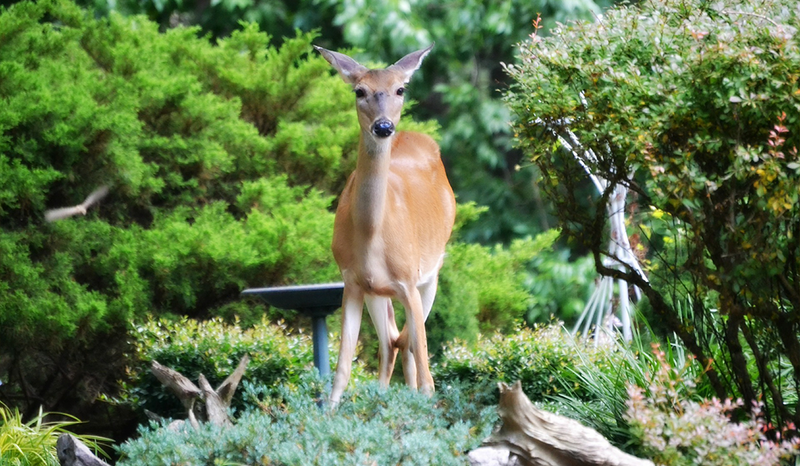 Of course, deer-proof plants are a no-brainer. Sage, thyme, rosemary, and oregano are all herbs that deer tend to hate, but pasta lovers tend to adore. As a general rule for preventing tree damage by all of these rodent species, we recommend installing burlap wraps along with tree guards in the fall. We’ll show you how to put them on in a future blog post later in the season. If you’re already using these safeguards, you can start removing them now that we’re seeing some days above 10℃. Sooner or later, we all have to deal with a few party-poopers. Pest control is a necessary evil of gardening, but luckily there’s a lot of overlap in each of these prevention tactics that should help keep out the worst of them. If worse comes to worst, there’s always the option of hiring a professional exterminator, but most cases can be dealt with proactively. Ask one of us at Royal City Nursery before you spend the big bucks on a pest control service – keeping your garden “club” teeming with the right clientele might be easier than you think! Become one of our Royal Rewards Members today and start saving! Receive garden tips, landscaping advice and more delivered right to your inbox. Plus! Become one of our Royal Rewards Members today and start saving!